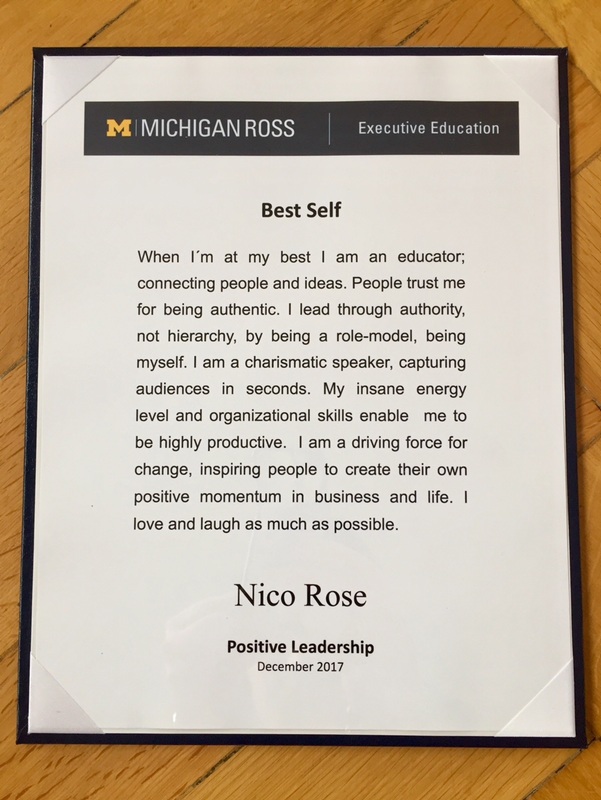 In mid-December, I got to spend a week in Ann Arbor at the Ross School of Business, taking part in an open enrollment course called The Positive Leader: Deep Change and Organizational Transformation. It´s a formidable tour de force through the most important frameworks and applications of Positive Organizational Scholarship (POS). I´m going to write some more about my experiences over the upcoming weeks. Today, I´d like to share with you the Reflected Best Self Exercise™, a powerful tool that helps people to learn more about their individual strengths and what they´re like when they display some form of peak performance (from the vantage point of other people). In short, the exercise is about asking a group of people to supply you with stories of times when they perceived you to be at your best. In other words, you ask people for feedback about your strengths and capacity for peak performance – and only about that. What other people appreciate about us tends to appreciate over time. What´s so special about receiving only positive feedback once in a while? It´s extraordinary because we typicially hear mixed messages, e.g., as part of a performance appraisal at work. What´s the point? Rick Hanson, author of “Hardwiring Happiness”, likes to say “our mind has velcro tapes for negative and teflon layers for positive information.” Even if the usual feedback we receive is mostly positive, our brain drives us to ponder almost exclusivley on the negative (= potentially harmful) information. This mode of processing has actually helped us to survive as a species over thousands of years (please see Bad is Stronger than Good for more background) – but it also keeps us from truly taking in any positive information, unless we explicitly allow ourselves to focus on that side of the spectrum, so we can learn and grow based on who we are when we´re at our best. bolster our sense of self-worth and our belief in the goodness of others. The last bullet point seems especially important to me as it points towards the so-called Pygmalion Effect, the phenomenon whereby higher expectations by others lead to an increase in actual performance. When we ask people to reflect on our positive sides, we actually help them to perceive what Jane Dutton calls the “zone of possibility”, a reservoir of untapped resources and growth potential. Via authentically pointing us towards these strengths and capabilities, they help us to become more than we currently are. This is the true nature of appreciation. The typical connotation of “to appreciate” points towards a strong form of liking. But it also means to grow in value. What other people appreciate about us tends to appreciate over time. How does the Reflected Best Self Exercise™ work? Collect stories from a variety of people inside and outside of your work. You should receive feedback from at least 10 people. By gathering input from a variety of sources, such as family members, past and present colleagues, friends, teachers etc., you can develop a broader understanding of yourself. Specifically, ask them to supply you with short stories of episodes when they perceived you to “be at your best”. Ask for specific and tangible examples, not general impressions. Recognize patterns and common themes: After gathering those stories, read through them carefully, allowing yourself to take and savor in the positive content. Then, go through them several times, making mark-ups and remarks with a pen. The goal is to search for common themes and recurring patterns within the different stories. These commonalities will serve as the base for your “Best Self Description”. Then, write a description of yourself that summarizes and distills the accumulated information. The description should weave themes from the feedback into a concise “medley” of who you are at your best. This portrait is not meant to be a complete psychological profile. Rather, it should be an illuminating image you can use as a reminder of your contributions and as a guide for future action (you can see the result of my own process in the picture on the right). To what extent is your current job playing to your strengths? Or should you maybe think about a change of careers to realize your full potential? I hope you will have tons of fun and insightful moments with this framework; I surely did. By the way, I´ve found out earlier this also works perfectly using social media channels such as Facebook and LinkedIn. You can read my account of this “experiment” here. Roberts, L. M., Dutton, J. E., Spreitzer, G. M., Heaphy, E. D., & Quinn, R. E. (2005). Composing the reflected best-self portrait: Building pathways for becoming extraordinary in work organizations. Academy of Management Review, 30(4), 712-736. Roberts, L. M., Spreitzer, G., Dutton, J., Quinn, R., Heaphy, E., & Barker, B. (2005). How to play to your strengths. Harvard Business Review, 83(1), 74-80. You´ll find lots of resources with regard to the Reflected Best Self Exercise™ on the website of the the Center for Positive Organizations at Ross School of Business. This is some stuff you should definitely check out if you´re in HR, or an (aspiring) leader – or if you want to up your game in general with regard to understanding positive organizations. All links lead you to PDFs of the respective articles. Cameron, K. S., Bright, D., & Caza, A. (2004). Exploring the relationships between organizational virtuousness and performance. American Behavioral Scientist, 47(6), 766-790. Dutton, J. E., Worline, M. C., Frost, P. J., & Lilius, J. (2006). Explaining compassion organizing. Administrative Science Quarterly, 51(1), 59-96. Heaphy, E. D., & Dutton, J. E. (2008). Positive social interactions and the human body at work: Linking organizations and physiology. Academy of Management Review, 33(1), 137-162. Mayer, D. M., Aquino, K., Greenbaum, R. L., & Kuenzi, M. (2012). Who displays ethical leadership, and why does it matter? An examination of antecedents and consequences of ethical leadership. Academy of Management Journal, 55(1), 151-171. Owens, B. P., Baker, W. E., Sumpter, D. M., & Cameron, K. S. (2016). Relational energy at work: Implications for job engagement and job performance. Journal of Applied Psychology, 101(1), 35-49. Spreitzer, G. M., Kizilos, M. A., & Nason, S. W. (1997). A dimensional analysis of the relationship between psychological empowerment and effectiveness, satisfaction, and strain. Journal of Management, 23(5), 679-704. Spreitzer, G., Sutcliffe, K., Dutton, J., Sonenshein, S., & Grant, A. M. (2005). A socially embedded model of thriving at work. Organization Science, 16(5), 537-549. Wrzesniewski, A., & Dutton, J. E. (2001). 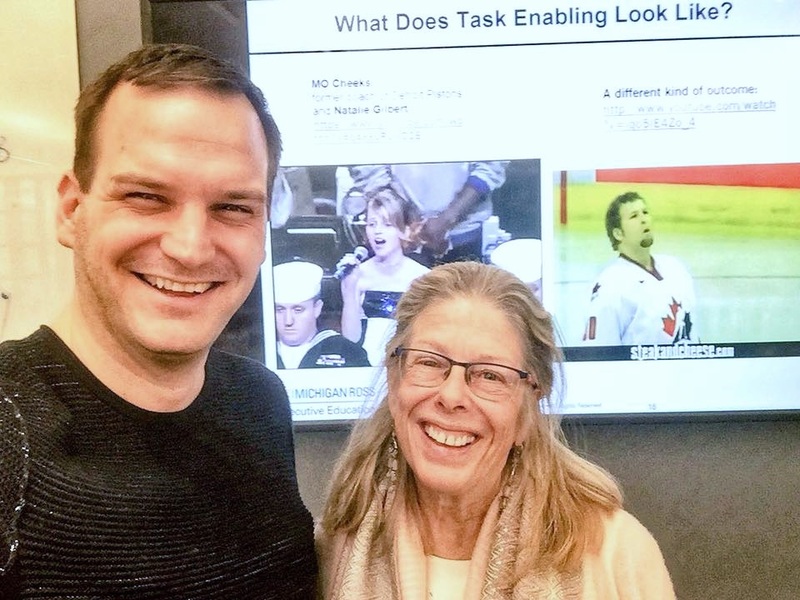 Crafting a job: Revisioning employees as active crafters of their work. Academy of Management Review, 26(2), 179-201. I´m the luckiest guy in the world. I get to spend the week at University of Michigan in Ann Arbor, more precisely: the Ross of Business. Part of the Ross School is the Center for Positive Organizations – which without exaggeration can be described as the global focal point for research and application(s) of Positive Psychology in business (Positive Organizational Scholarship). It´s home to POS luminaries such as Kim Cameron, Jane Dutton, and Robert Quinn. Additionally, some of the big shots in the field have completed their Ph.D. studies here, among them Adam Grant and Amy Wrzesniewski. My favorite news and blog articles covering Positive Psychology and adjacent topics from (roughly) the last seven days. I´m super happy. After my official TEDx premiere at TEDx Bergen/Norway in 2014 (How to be the architect of your own fortune), as of today, my second TEDx talk is available on YouTube. It was filmed at the very first edition of TEDx EBS late in 2016. EBS University (or European Business School Oestrich-Winkel) is one of the premier business schools in Germany and, coincidentally, the place where I obtained my Ph.D. The talk is named “Dare to Foster Compassion in Organizations”. It draws on research by luminaries such as Jane Dutton, Monica Worline, Adam Galinsky, Laura Little, Jennifer Berdahl, and the late Peter Frost (and even though they are neither mentioned nor referenced on a slide explicitly, Esa Saarinen, Adam Grant, and Robert Quinn). I hope you will enjoy the talk! And if you do, please consider sharing the news. Thank You! If you are interested in a (sort of…) transcript of the talk: this was published here a while ago. My favorite pieces covering Positive Psychology and adjacent from (roughly) the last seven days.